Red flowers evoke passion, energy, and vivacity. You don't need roses to convey that type of intensity. Roses are fleeting, but these red flowering indoor plants will keep you in blooms for weeks, maybe even years. Keeping flowering houseplants happy can sometimes be a challenge, especially during winter, but it is a challenge with a great payoff. There are ruby bloomers for just about any growing conditions, so look for one that will brighten your home. 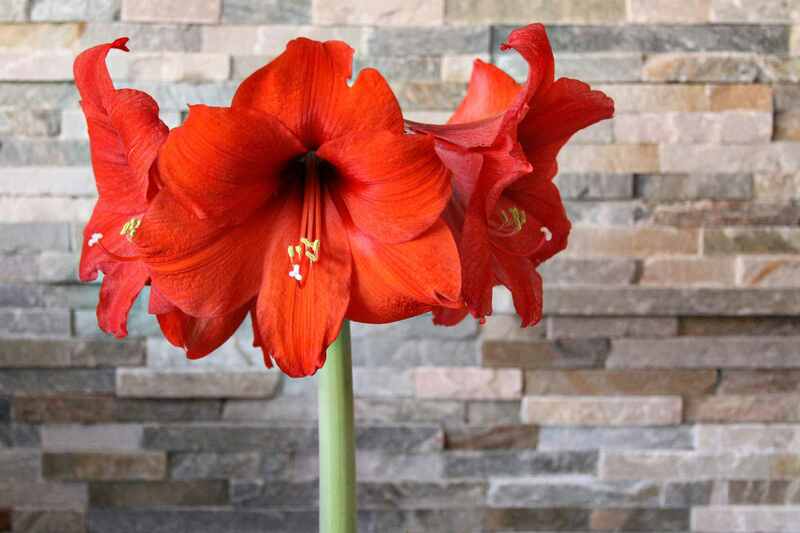 Amaryllis bulbs have been specially bred to be grown indoors and are incredibly easy to care for. They bloom in winter, when you need a burst of color, and they will stay in bloom for weeks. Each year, the plump bulb gets a little stronger and sends up additional flower stalks and blooms on long, sturdy stems. If you want your amaryllis to bloom at Christmas time, you will have to do a bit of forcing. But if you are happy to have it bloom on its own schedule, the only offseason care it needs is to be put outdoors for the summer. Is your house sunlight challenged? Are you a little lazy about watering your houseplants? The Guzmania Bromeliads are the perfect plant for you. In their natural element, they are epiphytic, pulling water out of the air. You can let it pool at the base of their cupped leaves and the plant will water itself as it needs it. They don't even like to be repotted, although you will get lots of new plants, called pups, popping up around the edges of your original bromeliad. If you think of cacti plants as prickly and boring, take a closer look at "Ruby Ball" cactus. It may look like your typical cacti with a red flower, but that red bauble on top is actually another cactus that was grafted onto the lower plant. The red cactus is an albino and it would not be able to survive long without the aid of the lower green cactus that does all the photosynthesizing for both. It is just as easy-care and forgiving as any other cactus plant, but you get indefinite "flowering". Chenille plant's major flaw is that it can grow and flower too much. Don't let that stop you from growing it. If the stems get too long or there are too many fading flowers on your plant, simply trim it back to about 12 inches and stand back. In a short time, you will get a full, bushy plant covered in those lovely fuzzy catkins that are just begging to be touched. This is a profuse bloomer, so it will need regular feeding. Other than that, all you have to do is enjoy the sight. If you are looking for a challenge, growing ixora as a houseplant is a rewarding one. These are very capricious plants. If you can find a sunny spot where your plant is happy, leave it there. Any change in exposure can cause it to wilt. But if you can keep it warm and sunny, you will enjoy dozens of large flower clusters surrounded by glossy, green leaves. Love the look, but don't have the sun? You might also want to consider dwarf Ixora (Ixora chinensis) which is considerably smaller and less fussy than its slightly flashier cousin. For a taste of the tropics, you can't beat Anthurium. Buy one already in flower, so you are certain the blooms are red. Actually, the red heart-shaped flower is a modified leaf called a spathe. The spathes can cup the true flowers or arch backward, giving them another common name of Painted Tongue. Each flower stays in bloom about 6 weeks. They also make great cut flowers in arrangements. Anthurium does require a bit of extra care to give it the bright sun and high humidity it needs to re-bloom. 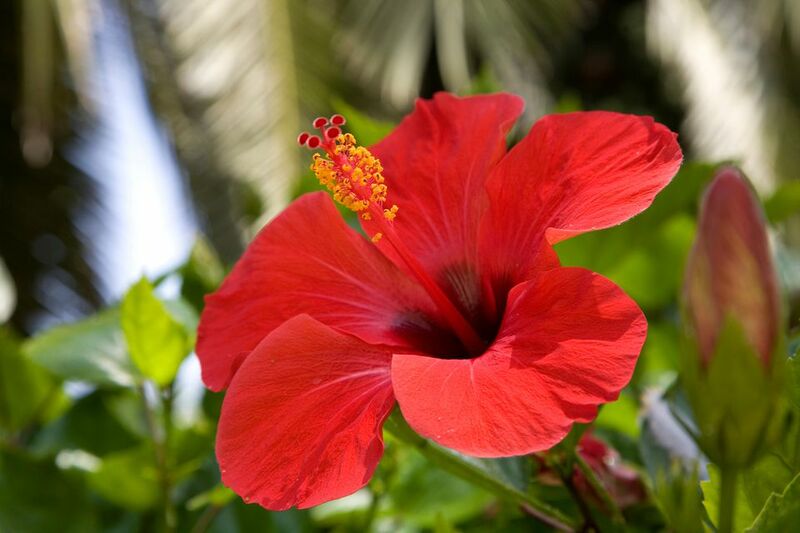 Few flowers can beat tropical hibiscus for year-round flowering. If you can keep your hibiscus warm and in bright sunshine, it will flower its little heart out. If you can't meet these conditions in winter, take heart, your hibiscus will just take a little rest and be ready to rev things up again in spring. These can be large plants when grown outdoors, but you can keep them in check indoors by pinching the new stems when they reach about 2 inches in length. They will branch out and start to set flower buds, rather than growing long branches. Kalanchoe plants are succulents that require minimal fuss. They can be a bit temperamental about getting enough sun and heat, but most are sold while in bloom and will remain colorful and vibrant for several weeks. The tricky part is getting them to rebloom. As with poinsettias, Kalanchoe plants require long periods of darkness to set more buds. Most people either kill them with kindness or simply toss them after flowering. Lipstick plant is a trailing vine that produces an abundance of tubular flowers that really do look like a tube of lipstick. It is a tropical epiphyte, which means it usually grows on some other plant rather than in soil. Being tropical, lipstick plant thrives in bright light and humidity. It may take a break from flowering during the dark, winter months, but will perk up again with some warmth and sunshine. No, shrimp don't grow on trees, but the overlapping bracts of Justicia brandegeeana really do give the appearance of a prawn. Although tropical, it is not as demanding as you might expect, growing well in the same room temperature you enjoy. It likes bright light and can get a little bedraggled by the end of winter. Cut it back to about 12 inches in early spring and it will be ready to start growing and flowering again within a few weeks.